Roosevelt elk are Oregon's largest land mammal, weighing up to 1100 pounds and standing as tall as 5 feet as the shoulder. Antlers can reach spreads of nearly three feet. For over 2 decades, visitors have enjoyed seeing these magnificent animals at Dean Creek. 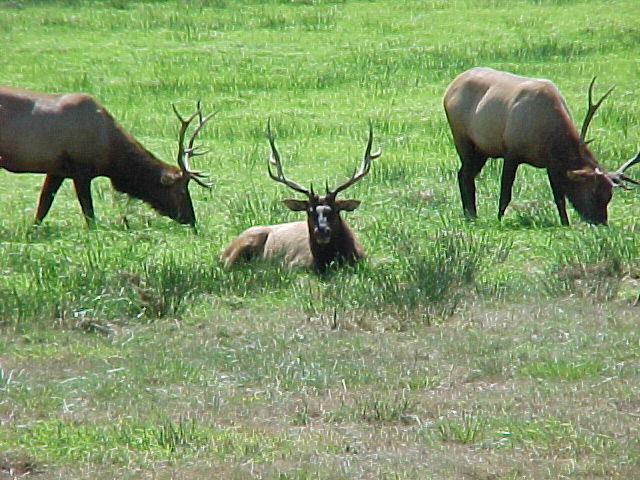 Dean Creek's herd can reach as many as 120 elk. A mild winter climate and abundant forage allow the elk to remain year-round. They roam freely, their numbers and whereabouts changing with the seasons. Ongoing projects enhance the meadows and assure the health of the herd. Some meadows are hayed and fertilized each summer to stimulate growth and raise forage quality. Management plans include reseeding meadows, and tilling and seeding small sections every 5-10 years.